Jurnal The Messenger is an International Scientific Journal, published by the Department of Communication, FTIK, Universitas Semarang, Central Java, Indonesia. Jurnal The Messenger is intended to the national and international scholarly community. The aim of this journal is to publish high-quality articles dedicated to all aspects of the lates outstanding developments in the field of communication. Articles published are the results of research, bringing the new sights (scope) on Cultural Studies, Integrated Marketing Communication, and Media. Meanwhile, submitted papers are evaluated by double blind peer review for contribution, originality and relevance. 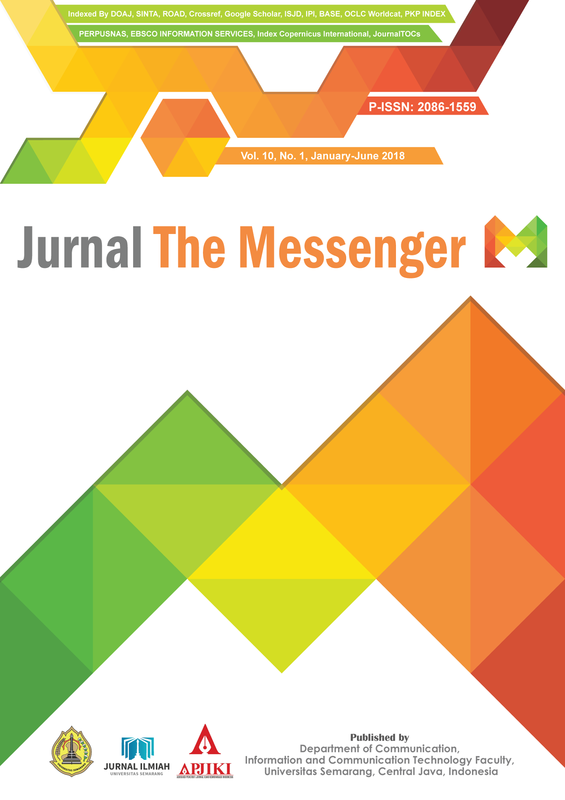 Jurnal The Messenger are published twice a year in January and July (Regular Issues). It was first published in 2009. Jurnal The Messenger is indexed at Directory of Open Access Journals (DOAJ), Science and Technology Index (SINTA), Microsoft Academic Search (MAS), Directory of Open Access Scholarly Resources (ROAD), Digital Object Identifier (DOI) prefix 10.26623 registered by Crossref, Dimensions, Google Scholar, ISJD, Indonesian Publication Index (IPI), Bielefeld Academic Search Engine (BASE), Online Computer Library Center (OCLC) Worldcat, Public Knowledge Project (PKP) Index, Indonesia Onesearch by PERPUSNAS, EBSCO INFORMATION SERVICES, Index Copernicus International, JournalTOCs, CiteFactor, GARUDA: Garba Rujukan Digital by Ristekdikti - Indonesia, British Library, Harvard Library, and Columbia University Libraries. You have to make sure that your paper is prepared using the Jurnal The Messenger paper TEMPLATE, has been carefully proofread and polished, and conformed to the Author Guidelines. Jurnal The Messenger (JTM) is seeking scientists, researchers, educators, and practitioners to be editors and reviewers for the our journal. If you are interested to be editors or reviewers for JTM (min H-index: 5 in Scopus/Thomson Reuters Web of Science database), please send an e-mail to: jurnalthemessenger@usm.ac.id or yuli@usm.ac.id. Email subject: JTM Editor/Reviewer Application. Include the following information: (1) Your Full Name; (2) ORCID ID, SCOPUS ID, and other researcher ID; (3) Institutional Affiliation; (4) Education and Degree; and (5) Research Designs in which you hold expertise (please refer to journal focus and scope). MOU with APJIKI (Asosiasi Penerbit Jurnal Ilmu Komunikasi Indonesia).